Typical Amazon Fare, a pack of lies from the Kindle News letter. Q. Are authors allowed to review another author's book? A. Yes. We very much welcome Customer Reviews from authors. However, if the author reviewing the book has a personal relationship with the author of the book they are reviewing, or was involved in the book's creation process (i.e. as a co-author, editor, illustrator, etc. ), that author is not eligible to write a Customer Review for that book. Authors can't review books of people they know. How does Amazon verify that? They don't, they just pull a review if one of their trolls report it. Q. Can I post a Customer Review on behalf of someone else? A. No. Customer Reviews are meant to provide customers with feedback from fellow shoppers. For this reason, you should use the Editorial Reviews section of your book's detail page to share content that is posted on other sites or from individuals who do not have an Amazon account. You can update the Editorial Reviews section of your book's detail page through your Author Central account. Gee, I bet that question comes up a lot. Q. Can I ask my family to write a Customer Review for my book? A. We do not allow individuals who share a household with the author or close friends to write Customer Reviews for that author's book. Customer Reviews are meant to provide unbiased product feedback from fellow shoppers. Another absurd rule that is unverifiable. Again they just delete the review on the word of the trolls. Q. Can I pay for someone to write a Customer Review for my book? A. No. We do not allow any form of compensation for a Customer Review other than a free copy of the book provided upfront. If you offer a free copy of the book in advance, it must be clear that you welcome all feedback, both positive and negative. That is unless you buy reviews through an Amazon subsidy, createspace for $385, then it's OK to buy reviews. Q. A Customer Review is missing from my book's detail page. What happened? The review did not meet our posted Customer Review Guidelines. The customer who wrote the review removed it. We discovered that multiple items were linked together on our website incorrectly. Reviews that were posted on those pages were removed when the items were separated on the site. We can only discuss specific Customer Review removals with the person who originally posted the review. Absolute lies, There is no rhyme or reason to Amazon's policy. I particularly like the last excuse, absolutely nothing to do with single item books. Just this last week I was on the phone with Amazon over a 1-star no read review. I was told only the reasons above could get a review removed. So I wrote 3 1-star reviews and posted them on the 1, 2, 3 best-sellers where they would do the least harm. Since reason three to remove a review is not applicable, and I, the reviewer didn't remove them, that only leaves us with it violated the guidelines. I didn't know the authors, I didn't use profanity, I made no threats, and I made no racist remarks. So why were the reviews pulled? Again because the trolls didn't like them. Listen here to the phone conversation where I am told that although the review was made by someone who admitted they hadn't read the book it didn't violate the guidelines and couldn't be pulled. Yet mine were promptly removed. Maybe the fact the trolls turned the comments into an ongoing personal attack to the turn of 150 comments on each review may have something to do with it. The trolls saw it as a huge victory, but I expected them to be pulled before I posted them. I have dealt with Amazon in this area before no actual reason will ever be given for why a review is deleted, just allusions to their ambiguous guidelines. 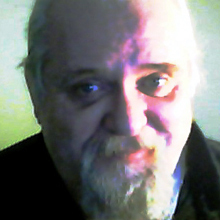 I am currently working on an expose' of the way the same trolls on both Amazon and goodreads have compromised the review process to such a degree, coupled with Amazon insane policies, they've rendered every review on those sites worthless. 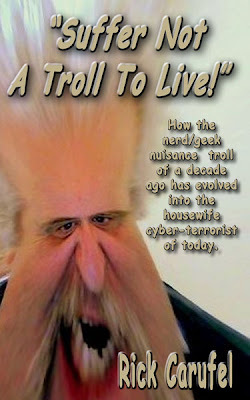 The title, “Suffer Not A Troll To Live” has already been reported as death threats to Amazon by the trolls. This book will so outrage the entrenched trolls they may try to get it banned from Amazon because of the title although not one of them will admit to being a Troll. Here's a TV interview I did recently for the local news. The situation with online reviews is appalling. The trolls that infest Amazon only attack indies and everyone of them are convinced that the self-published writers only produce trash and every indie book they review gets a 1-star and a personal attack. I have over 500 forums posts from Amazon and every one is an insult and a personal attack. I have also done a press release about the cyber-stalking, cyber-bullying, harassment, and cyber-terrorism rampant online. All aimed at the indies. Here's a few things to think about. How can these trolls seem to be online for up to twenty hours at a time? Why do they target only the indies? 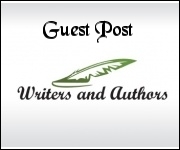 Who has the most to gain from the persecution, and that's what it is, of the indie writers? Traditional Publishing. I suspect the entrenched publishers are going to hang on as long as they can demeaning the indies to the end as less than reputable and illegitimate. I wouldn't put it past the big six to hire trolls to endlessly harass the very people they wrongly blame for their losses and Amazon is in cahoots with them. Corporatism is out of control and if governments don't reign them in it is the corporations who will be running everything real soon. Amazon is a prime example of the corporate attitude that they are above the law and they can do as they please. Maybe a cease and desist order, closing them down until they prove they no longer harbor a gang of cyber-terrorists operating from their forums, may sober them up.